There was a time in America when Sunday night meant The Ed Sullivan Show. With its consistently strong ratings, a booking on the variety program was a golden opportunity for performers of any stripe, whether a puppeteer, plate spinner, comic or rock ’n’ roll band, and everyone, it seemed—young and old—was in front of a TV set to watch the former newspaperman and his guests at the end of every weekend. Sullivan wasn’t a rock fan but he didn’t let his indifference show, as some other hosts did. He was happy to present the biggest acts of the day and, of course, was instrumental in breaking some of the all-time greats, particularly Elvis Presley and the Beatles. He showcased R&B artists, including many of the Motown performers, and every type of rock band and solo artist. No matter how cool they thought they were, few turned him down (although Bob Dylan did walk off the set when told he could not sing the song he wanted to). Even if you’d played the hippest venues, you didn’t really “make it” until you’d been on Sullivan. 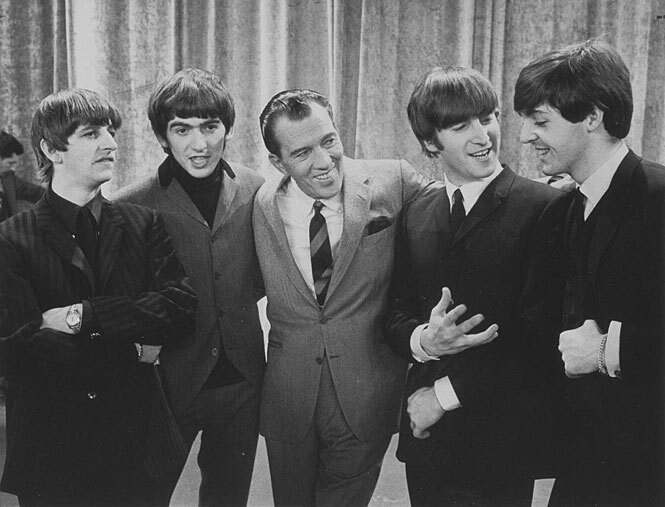 Here are 10 classic Ed Sullivan Show performances. Ed Sullivan didn’t much like the Rolling Stones. Where he saw the Beatles as well-mannered gentlemen, he thought the Stones were a bunch of rude slobs. Nonetheless, the teenage viewers needed their fix of the day’s biggest rock stars and Sullivan obliged, continuing to invite the Stones back after their initial 1964 appearance, in 1965, ’66 and then again on Jan. 15, 1967, by which time they’d long become established as rock’s bad boys. For their first song, the Brits, at their dandiest, with Brian Jones playing the recorder and Bill Wyman bowing an acoustic bass, first performed their hit “Ruby Tuesday.” For their second song, they’d been cautioned earlier in the day that the CBS censors did not want to hear them sing the title phrase of “Let’s Spend the Night Together.” Instead, they were to substitute the phrase “Let’s spend some time together.” What happened—check Mick Jagger’s eye roll at 4:28 in the clip—became rock ’n’ roll history. You’ve got to wonder what the members of Jefferson Airplane were thinking when they agreed to appear on The Ed Sullivan Show. Here they were, the consummate psychedelic, anti-establishment San Francisco band, and Ed Sullivan was…Ed Sullivan. Did this mean they were selling out? Nah, everyone wanted to play for Ed, and the Airplane (“the number one rock group in the country,” the host said) gamely did their part on Sept. 29, 1968, performing the title track from their fourth studio album, backed up by Glenn McKay’s Head Lights with all of its pulsating liquid blobs. “Four citizens of the sovereign state of Texas…the Crickets with one of their hit records,” is how Sullivan introduced Buddy Holly and the boys on the Dec. 1, 1957, show. “That’ll Be the Day” and “Peggy Sue” are faithfully reproduced, the group notably more subdued onstage than many of their contemporaries but packing a whole lot of pure rock ’n’ roll into their two spots. One can only imagine what some folks in the viewing audience made of James Brown’s (or “Jim Brown,” as Sullivan calls him before quickly correcting himself) fancy footwork and unfettered approach to soul music when he appeared on May 1, 1966. Sullivan provides an unusually long background intro (“he worked on a farm, picked cotton, worked in a coal yard and always sang his songs”) and then there he is, unstoppable, at his peak, with those moves that no one else dared even try. The group of brothers from Gary, Indiana, had just started climbing the charts with their first hit for Motown when Sullivan—always a supporter of Berry Gordy Jr.’s stable of acts—booked them on the show. On the night of December 14, 1969, the nattily dressed kids first performed a cover of Sly and the Family Stone’s “Stand” and a Smokey Robinson tune, “Who’s Loving You.” Then, for their third number, standing in a neat row and working out the choreography they’d been taught so well, they launched into their funky hit. Michael Jackson was 10 years old. From the moment he stepped up to the mic, there was no doubt that he was going to be a star—a very, very big star. By the late ’60s, Ed Sullivan must have been wondering just what the heck was going on in popular music. Sure, he’d helped recharge the rock revolution when he brought over the Beatles, but these hippie types were something else altogether. Still, old Ed—or whoever was booking his musical acts by that point—understood success, and there was no denying that Janis Joplin was a superstar. Here, on March 16, 1969, she tears the roof off the place with her sweaty take on “Raise Your Hand,” an uptempo soul stomper recorded a couple of years earlier by Eddie Floyd. Elvis Presley’s first national television appearance did not take place on The Ed Sullivan Show but rather on The Dorsey Brothers Stage Show, in January 1956. Then came spots on programs hosted by Milton Berle and Steve Allen. It wasn’t until September 9, 1956, that Sullivan—who had previously been reluctant to book him—finally showcased the singer, the first of three times he’d appear. Elvis sang four tunes on that maiden appearance, including a rollicking rendition of “Don’t Be Cruel” on which he was accompanied by the Jordanaires vocal group, and “Love Me Tender,” the theme from his first film. America was still here the next morning, but something about it was different. By the time Elvis made his third and final appearance on the show, he was famously shot only from the waist up, lest those impressionable young minds watching his gyrations be corrupted for life. The world changed—it really did—when Ed Sullivan introduced “these youngsters from Liverpool, who call themselves the Beatles,” on Feb. 9, 1964. That initial appearance drew the largest television audience of all time, some 70 million people. Every second of that first show was breathtakingly exciting, but the group’s followups shouldn’t be given short shrift. Watching them power through their definitive cover of the Isley Brothers’ hit on Feb. 23, it’s easy to get a feel for what it must have been like to be inside of the Cavern, knowing that some day, some way, the rest of the world would know what you already did. Well, it’s not that big an accomplishment, when you consider there were only 2 and a half networks at the time. You left out the Dave Clark 5 who were on the Ed Sullivan Show more often than the Beatles and had a string of hits which simultaneously matched the Beatles. It’s too convenient to forget just how big and popular the DC5 were at the same time as the Beatles. You folks do a good job with the history of this period. The DC5 were a very important band with a huge number of hit songs. I recognize their importance has waned considerably, in large part because of how Dave Clark has witheld release of their material over the years. Still…they belong in any retelling of the 1965-1970 period. We LOVE the Dave Clark 5, and yes they were huge, but as you noted, Mr. Clark has withheld the release of the band’s music. Therefore, the only Sullivan clips available on YouTube are under a minute long. If we do a followup piece, we’ll be sure to include them. The DC5 were little more than a Beatles clone, and were very exciting for a couple of years. However, their music was primitive and repetitive, thus lacking enough substance to be of any lasting value. That’s why they’re forgotten. It was the very FIRST segment of all The Beatles performances that would become the most important 10 minutes in television history, otherwise known as “The Big Bang” in pop culture. You can hear the exact moment, when they tear into “She Loves You”. Yes, we make it clear that the Feb. 9 appearance is the one that changed the world. But we wanted to point out that the other shows were great too. That Buddy Holly clip was awesome. There will never be another Buddy Holly. Stones do not belong on that list… Dylan, who was not a Big Star at the time, walked out on Sullivan when he was told Sullivan didn’t want him to sing Talkin’ John Birch Society Blues”.. When Sullivan told The Doors Morrison couldn’t sing the line “Girl, we couldn’t get much higher” they agreed, but during the performance Morrison looked straight into the camera and sang it anyway… as for Stones, Sullivan didn’t want them to sing the line “Let’s Spend the Night Together”.. so Jagger sang “Let’s Spend some time together.”… he caved.. Dylan and Morrison did not… that’s why Stones don’t belong on that list..